I've been seriously in love with Sharpie manis lately, and I just can't stop lol I love the brightness, how easy they are, and they're just in yo face! LOVE This was also the second time I tried out the Clear Jelly Stamper that was sent to me for review, and I'm digging it. Who knew placement could be so damn easy? I'm all about dat base, dat base...ok old irrelevant joke lol Painted Polish Midnight Mischief has quickly become my fav black base and black stamping polish fo real. If you are a thick coat painter this is definitely a 1 coater and is crazy opaque for stamping. 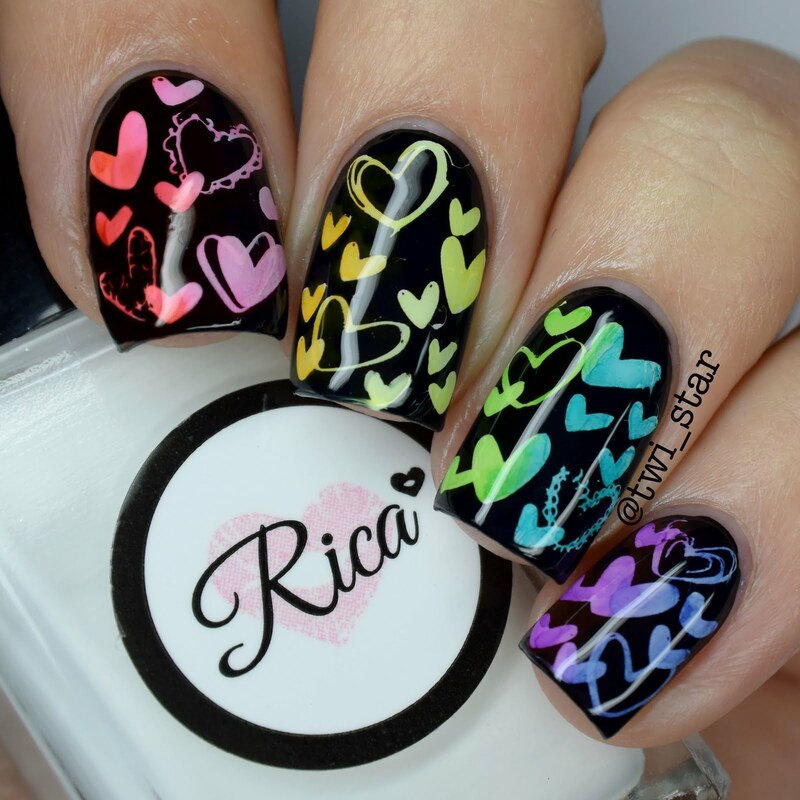 I love how with the Clear Jelly Stamper I could really get the composition of those hearts! To paint with the sharpies, I draw with them onto wax paper and then using 91% Rubbing alcohol aka isopropyl with a brush you can pick up the marker from the wax paper and apply to the nail. So fun! -Bursh - Twinkled T Cotton Dandy Brush set - Use code TWISTAR for 10% off! 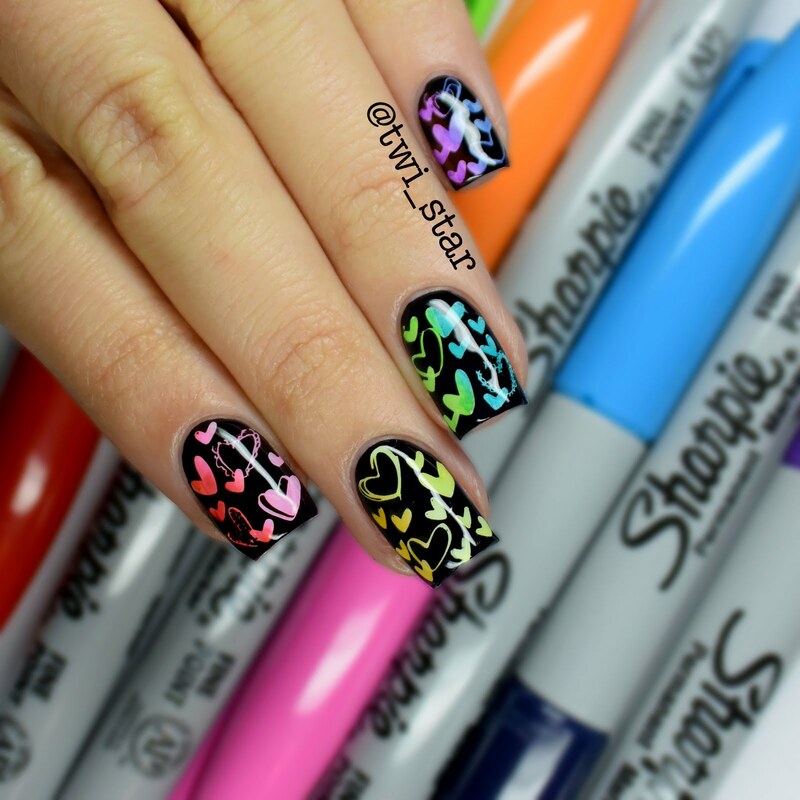 Have you tried using sharpies for nail art? Disclosure: All or some of the product(s) in this post were provided to me by the manufacturer or their PR company for consideration. Please see my Disclosure Policy Disclosure Policy for more info. I do earn a commission with the use of Affiliate coupon codes. so...my daughter wants this on a comforter for her bed. You should get into textile design! I kinda wish you had done a tutorial. This is so pretty! I've been eyeballing Midnight Mischief as a stamping black for a while now. I'm glad to see it in action! Love this!! I'm definitely gonna try this!! I would love to see this as a tutorial! Gorgeous!